Elaine here, posting the second of our book projects after our decision to re-launch our shared blog here, just when everyone had given up on us! I have to confess, this project is Mark 2 for me. I started off well with my initial idea, but it went a bit pear shaped! That one may appear in due course on my own blog. Anyway, here is my take on the accordian book. I recently purchased the Hardwood stamp from Stampin' Up. I love wood effect backgrounds so I knew this would be well used in my collection. The shape of the stamp guided me to a rectangular format for my book, and I stamped each page in Cobalt Blue archival ink on grey card. I added shading around the edges in Stormy Sky and Frayed Burlap Distress Inks to give an aged effect. I knew I wanted continuity through the pages, so chose the same colour background throughout and added the same leaves - using a Dylusions stamp. I fussy cut the leaves and added colour with Distress Markers. I love insects, (unless they are the biting kind!!!) and my stamp collection has many different variations. I have recently been index stamping my collection (it is still a work in progress), but it has made choosing and finding stamps so much easier when I have a theme in mind. My various insect stamp choices are stamped in Cobalt archival and unusually (for me) coloured with chalks. This really suited the muted colour palette I was looking for. The butterflies for my cover come from Stamp Camp and Crafty Individuals. The postmark used on the cover and throughout the book comes from the Mail Art set from Chocolate Baroque and the sentiment is from a Sam Poole set from Creative Expressions. 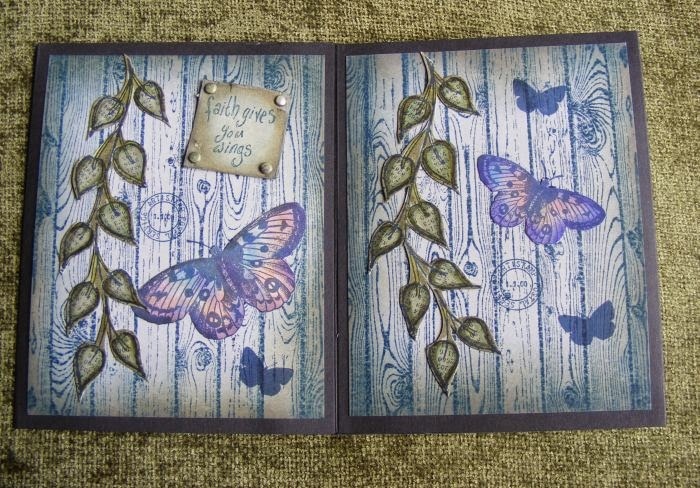 The first set of inside pages uses butterfly stamps from Indigo Blu (one of which was a freebie on Craft Stamper magazine). The silhouette butterfly is from a Martha Stewart set. The sentiment comes from a Lindsay Mason Doo Lally Pip set I purchased from the last Ally Pally show from AliCraft and I used the same set for the rest of the book. 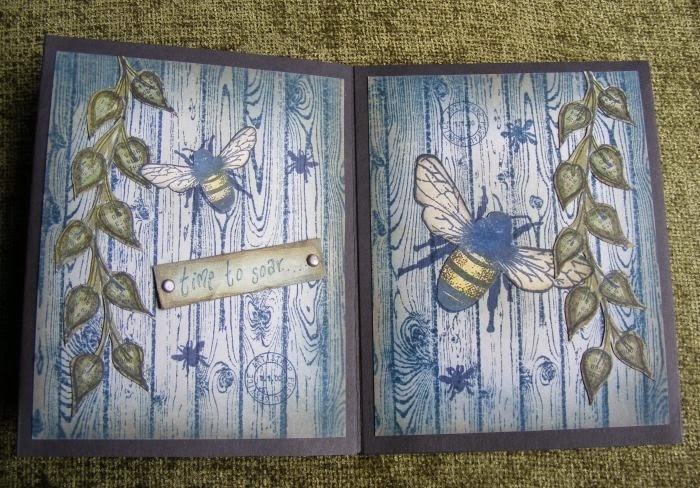 The second set of pages uses the beautiful Stampotique bee stamps designed by Jo Capper Sandon. These stamps have been shamefully underinked since joining my collection and I am delighted to have given them an outing! The silhouette bees come from a Quietfire set. 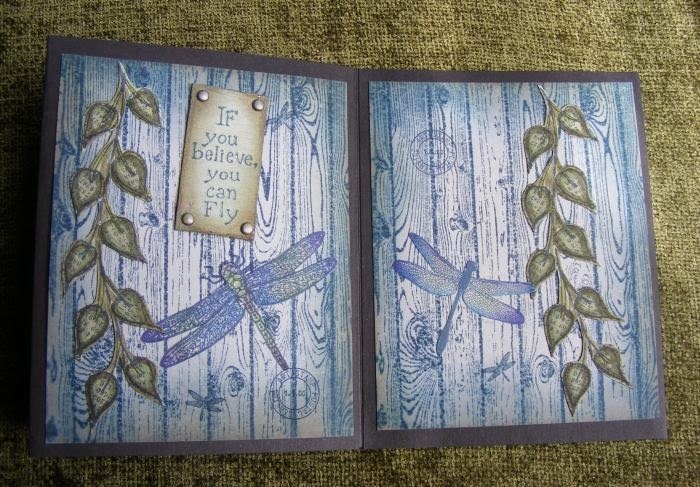 The final set of pages uses dragonfly stamps from Visible Image and a clear stamp I have forgotten the brand of! The tiny dragonfly which is virtually invisible is from Crafty Individuals. I mounted my book pages into black card for contrast. 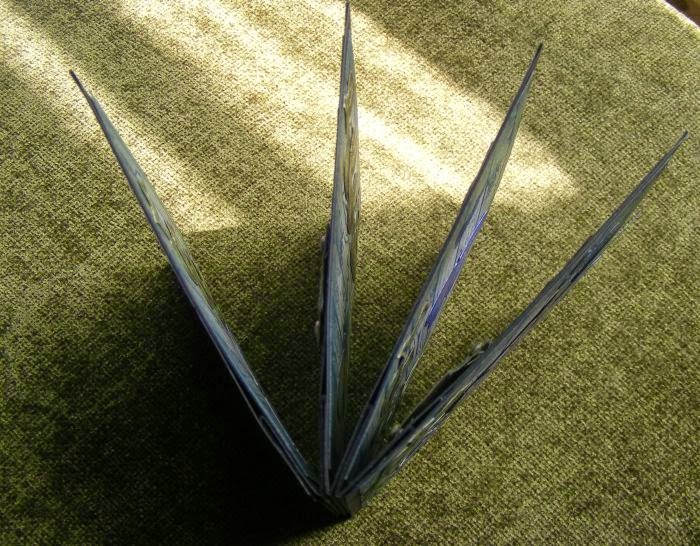 I puzzled about the construction after Lesley's experience and in the end decided to completely "internalise" my concertina, by sticking it between folded sets of pages. I made a little trial version to make sure it worked like me head told me it should!!! You can sort of see how it is put together in this pic. It has been great to have the push of getting a project together for our shared blog again after all this time. I have really enjoyed making this book with some of my favourite subjects, images and colours. Thank you for taking the time to stop by and having a look and do be sure to pop back later to see the projects from other girls. Good to see the quartet in action and this is a beautiful project with excellent choice of stamps and sayings. Love the gentle colours too. beautifully inked, stamped and constructed. Oh, this is really beautiful Elaine! I love the soft muted colours and the images you chose are lovely too and together create a rather ethereal mood. Gorgeous wood effect stamp and can see why you like it so much. Well done on finishing a second book as I know how tight you have been for time and energy recently but I do hope we get to see the one that went wrong sometime soon. How beautiful, love the soft colours. Looking forward to more from you all, have missed you. Like this a lot - definitely my favourite kind of insect are the inked or painted ones!! That is gorgeous. I love the wood effect & the different insects are so beautiful. Another lovely book, this is gorgeous. I love this wood effect stamp and it makes a lovely background for your insects. I'm looking forward to seeing what Judith and Debbie make now. This is really lovely Elaine, the soft colouring is just beautiful. The woodgrain stamp creates a perfect background for the various insects, and I love the continuity of the leaves throughout the book too. The chalk oolouring adds a lovely softness that matches your colour choices so well. Hi my lovely ladies, it's been too long, but can still remember our retreats with graphicus . Work as always is fantastic, really hope to see you all soon. Really beautiful, love the soft muted colours. A gorgeous book in your signature style, Elaine. That Hardwood stamp is stunning and I'm sure will prove very usable. Amazing how well you have brought together insect stamps from different collections and manufacturers and make them look like they belong together. 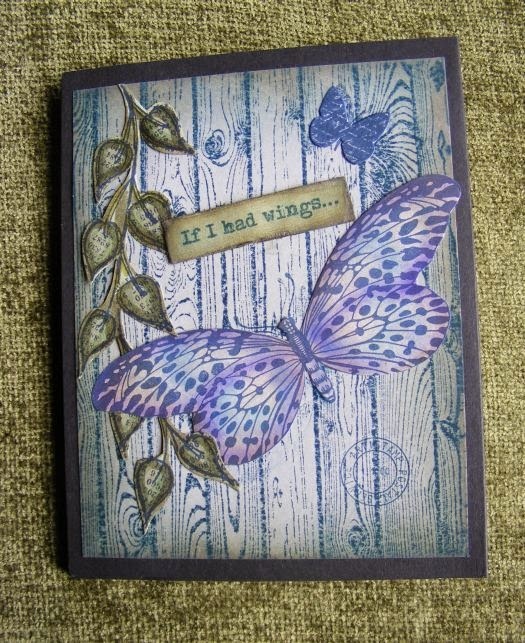 So pretty - I love the subtle blue tones, and the butterflies look great against the natural wood look backgrounds.